TFH Exclusive-Now with Deluxe Harness Full Support Swing Seats are award winning and the best selling Full Support Swing Seat for Adults. 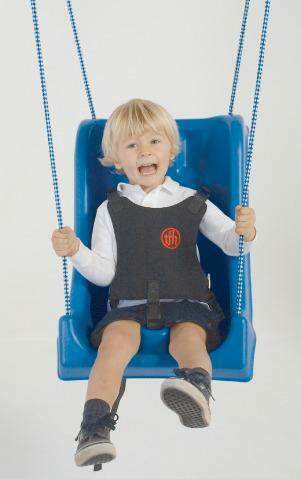 High Backed Swing Seats provide a supported ride. 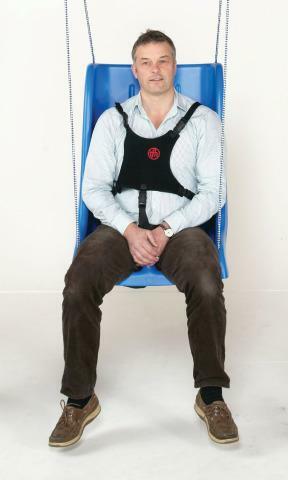 Seat incorporates a pommel & safety harness. Rope hardware allows seat to be adjusted to height and rake. For outdoor use, we recommend our Four Chain Suspension Package (8TCHNA). Sold separately. The Full Support Swing Seat for Child measures H: 22" x W: 13" x D: 12" Weight limit is 100 lb. 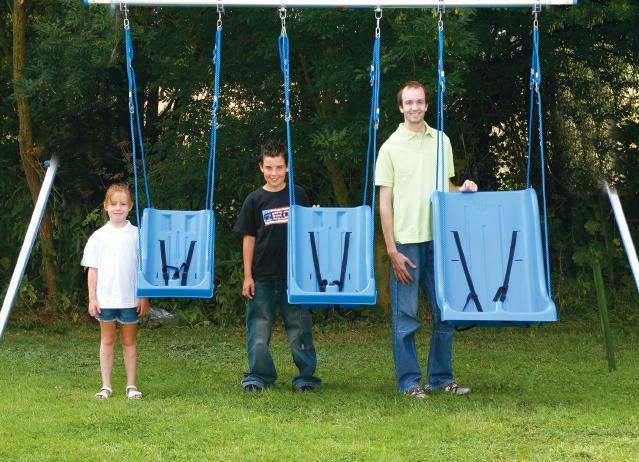 The Full Support Swing Seat for Teen measures H: 25" x W: 15" x D: 13" Weight limit is 180 lb. 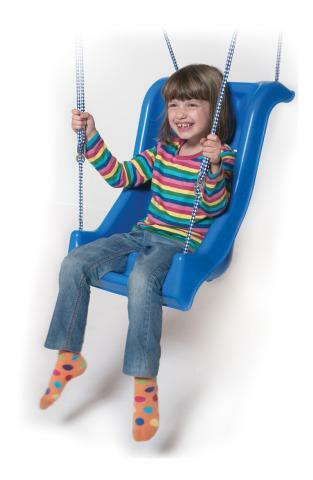 The Full Support Swing Seat for Adult measures H: 33" x W: 20" x D: 14" Weight limit is 280 lb. Ropes are UV stabilized for frames up to 9'. Also available in Adult (8TASS) and Teen (8TTSS) sizes. Dimensions: H: 22" x W: 13" x D: 12"
Great sturdy piece of equipment. The moulded design and fixings truly allows secure and safe enjoyment. Firstly, thank you TFH for bringing such a fabulous product to the market for all, whatever disability to thoroughly enjoy. Finally TFH, thank you for the great service..... A. Clarke, Norfolk, UK. My son loves his swing. Definitely worth the money. Very pleased with this purchase. The harness keeps our 6 year old son safely secured in the swing. We got the teen size based on some of the reviews, but it is plenty large for him (6 years old, 43 lbs, and 45" tall). It still works great since the harness is adjustable and gives him plenty of room to grow. Our daughters like iit a lot! My child and I are so happy with the swing we bought. It is very study and secure for the child, I don’t have to worry about him falling out. We already had a frame and this swing seat attached very easily to it. Many happy hours in the garden playing. My class loves their new swing! One little guy clapped his hands and grinned the whole time he was in the swing. I really like the new harness support. It's much more comfortable for the children than the straps.The swing was fairly easy to put together but the instructions could have been a bit clearer. Other than that we very pleased. This is a really roomy seat, with a high back. Could do without the pommel which is uncomfortable and makes getting on and off the swing tricky, (we have resorted to putting in a cushion). My 17year old, who weighs 60kg, is very happy and will swing for up to an hour! Excellent - lovely support allround and daughter is happy. I like the swing but do not like the raised bit around the groin area it gets in the way of the person sitting properly. This is our second swing, works perfectly. We now have bought the largest one for our 8 year old child. We use a sand bean pillow to get the correct support for her. Recommend this product. Swing is well made and exactly as pictured. However, I I ordered the "Teen" size and my daughter weighs less than 85 lbs and the swing is very snug. I'm thinking I should have ordered an adult size.